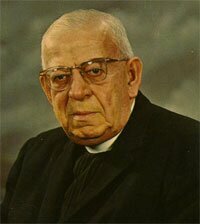 Father Kulinski was appointed pastor of St. Florian in 1934. He led the parish through the war years and during its largest population growth. Fr. Kulinski had been a Army Chaplain during World War I and his experience during that war left a lasting impression on him. During World War II, he was instrumental in arranging food and clothing drives not only for American fighting men but also the numerous Polish refugees affected by the Nazi Invasion of their home land. He also led daily prayer vigils during the War. After the War ended Fr. Kulinski had a war memorial erected for the parishioners who made the ultimate sacrifice for our freedoms. Following the war years, Fr. Kulinski oversaw the construction of a new school gymnasium / parish social center. On May 12, 1963, Fr. Kulinski celebrated his 50th Anniversary in the priesthood and his 30th as pastor of St. Florian Parish. Fr. Kulinski passes away on November 5, 1963.